“They” say that the restless dead get confused by corners and curves. 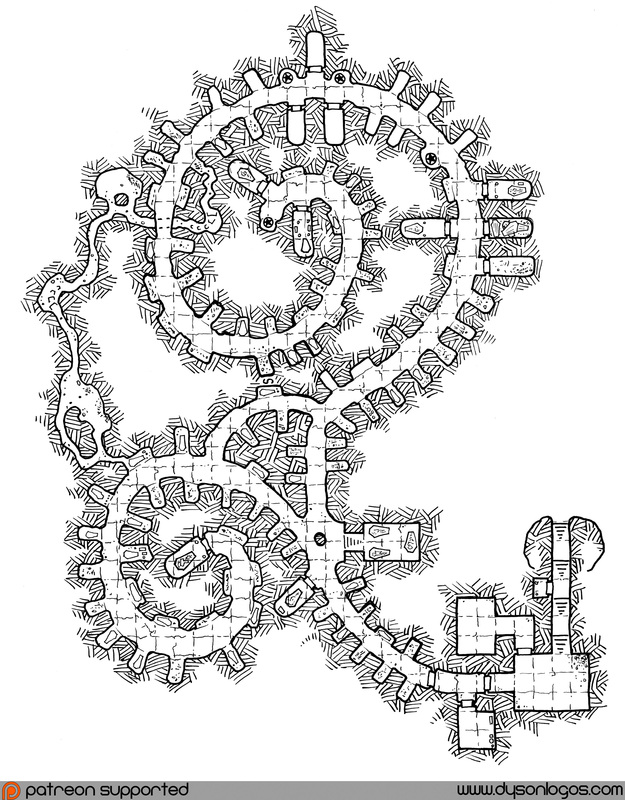 Thus they make their crypts into convoluted spirals and in some cases interlocking circles to confuse the restless dead and force them to remain underground, away from the living. These Spiral Crypts are a medium-sized crypt from a culture that espoused these beliefs before our modern awakened era. The crypts, and many like them, can be found near local villages and mixed in with the necropolis just to the east of the city gates. Other crypts from these earlier inhabitants are more complex, multi-tiered, spiraling and interlocking designs – far too easy for even the living to get lost in, let alone the brain-addled dead. The Spiral Crypts haven’t been entirely undisturbed, however. While the restless dead could not escape their new home, some did painfully claw out small caves and byways that they can hide within, hoping against hope that some day the old ways will come back into style, and new bodies will be entombed here for their consumption. This map was drawn based on an awesome request from Riley Vann. 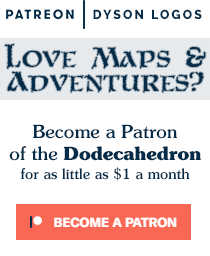 Every now and then I head over to my patrons at the $2.50 level and up and ask them what they would like in a map. A word, a name, a short description, a theme… And I try to draw them all in time. Some don’t work out, but others just click and things like this are the result. This map was drawn with Mitsubishi Uni Pin fine-tipped felt pens on 4-per inch graph paper (the first time I’ve worked with 4 squares per inch in close to a year, I believe). I REALLY like this one … and I think I have a good use for it. Thanks! Thanks. I really like this a lot. I am going to use this with my group as the map for the “Vault of the Elders” in B10 Night’s Dark Terror next week.